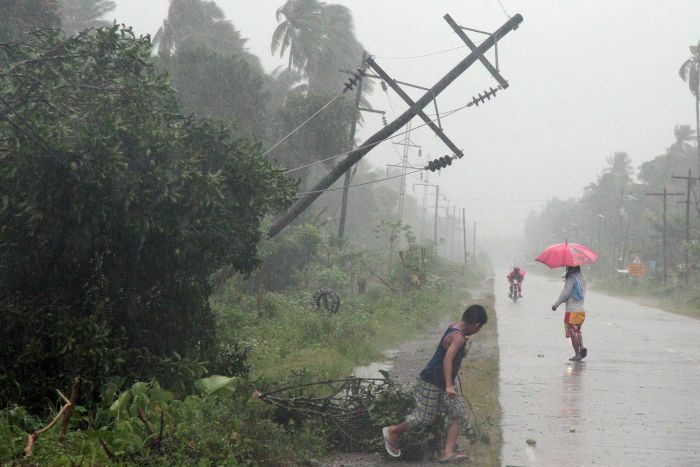 The death toll from powerful Typhoon Bopha battering the southern Philippines has risen to about 200, as rescue teams arrive in affected areas. At least 156 people are known to have died in Compostela Valley province alone when Typhoon Bopha struck eastern Mindanao, local officials said. Rescuers have reached most areas, but have had difficulty getting to some isolated communities. Many were evacuated ahead of the storm, now over the western island of Palawan. Typhoon Bopha is expected to move out into the South China Sea on Thursday. Compostela Valley province was said to be the hardest-hit area. Neighboring Davao Oriental province was also badly affected, with reports of about 50 people killed. In Andap village, in Compostela Valley, water and mud rushed down mountainous slopes to engulf a school and a village hall serving as evacuation centres. At least 43 people were killed there, with more reported missing and injured – including soldiers sent to help with evacuations. “The waters came so suddenly and unexpectedly, and the winds were so fierce – that compounded the loss of lives and livelihood,” Compostela Valley Provincial Governor Arturo Uy told Reuters news agency. He said water catchment basins for farms on top of the mountains had given way because of the torrential rains, sending down large volumes of water. He added that the cost of damage to agriculture and infrastructure in Compostela Valley province could reach at least 4 billion pesos ($98 million), with the typhoon destroying 70-80% of plantations – mostly bananas for export. Davao Oriental Governor Corazon Malanyaon said roads to dozens of towns were impassable because of fallen trees and collapsed bridges, and getting into them was like “running an obstacle course”. She said initial reports indicated that in one town, Cateel, 95% of the buildings had been damaged. Twenty-three people had drowned or were buried under fallen trees or buildings there, she said. Across the affected provinces, rescuers have also pulled out dozens of people from the mud, many of whom are now being treated in evacuation centres and hospitals. Most suffered facial wounds or limb injuries. Dozens of domestic flights and ferry services in the central and south of the country were suspended, and schools and businesses were closed while the storm passed. Bopha comes a year after Typhoon Washi killed more than 1,300 people in the southern Philippines. The storm devastated the cities of Cagayan de Oro and Iligan on the island’s north coast. Many of those who died were sleeping as Typhoon Washi caused rivers to burst their banks, leading to landslides. Entire villages were washed away.